That argument became a lot more serious last fall as lawyers for billionaire, Vinod Khosla, who has been excluding the public from the long-popular Martins Beach near Half Moon Bay, got a San Mateo County judge to issue an order finding that Khosla owns Martins Beach, tidelands and all. As we explained last year, these claims aren’t really based on rights under Mexican law, since tidelands were, and are, public under Mexican as well as California law. Instead they stem from the odd case of Summa Corp. v. California State Lands Commission, which found that when Spanish and Mexican grants were later confirmed by the federal government, anything and everything within the boundaries of the federally approved maps became private land, regardless of what it had been before. So did the federal Land Commission actually approve a map placing the current location of Martins Beach within a defined seaward line? It’s unlikely. Which makes this ruling much more disturbing, since it implies that this judge thinks all coastal tideland adjacent to federally confirmed Spanish and Mexican land grants (i.e. 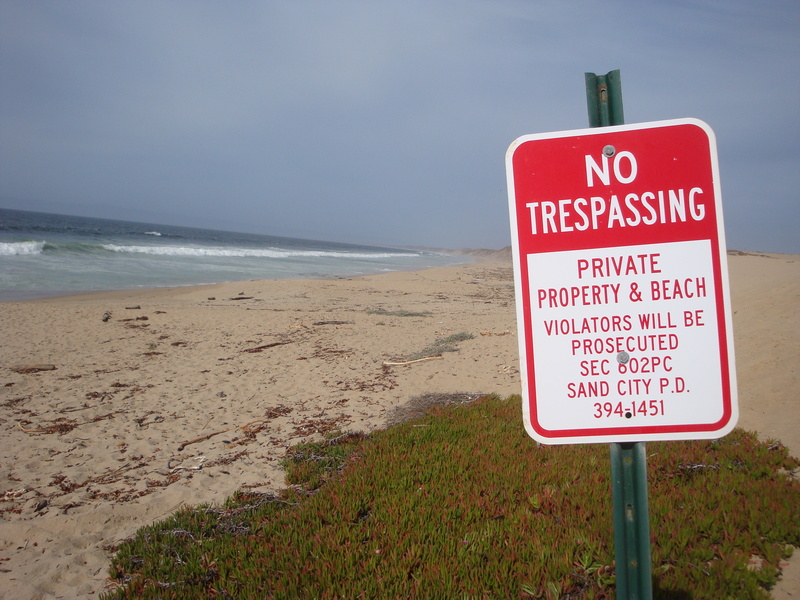 most of the California coast) is private property. Obviously, this fight is far from over. See our previous post on this subject for a fuller explanation of the legal theories involved. This entry was posted on Thursday, May 29th, 2014 at 2:19 pm and is filed under Coastal Development/Erosion, Courts. You can follow any responses to this entry through the RSS 2.0 feed. You can leave a response, or trackback from your own site. Regardless of what the courts decide, sea level rise will be the final arbiter of the matter. Still long odds though that the loss of everyone’s beaches will humble the oceanfront 1%ers.